Once you create a policy, you can change its settings to suit your business purposes. If needed, you can make temporary changes, called creating drafts, and then implement them later, called promoting to live. For more information, see Creating Policies. 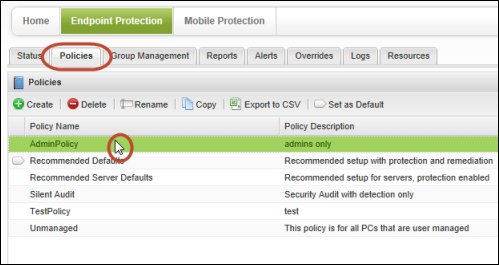 Policies control the following SecureAnywhere settings on managed endpoints. Click the Policies tab. A list of policies displays. In the Policy Name column, find the policy you want to change and double-click it. The recommended Defaults window displays, with the Basic Configuration category selected. 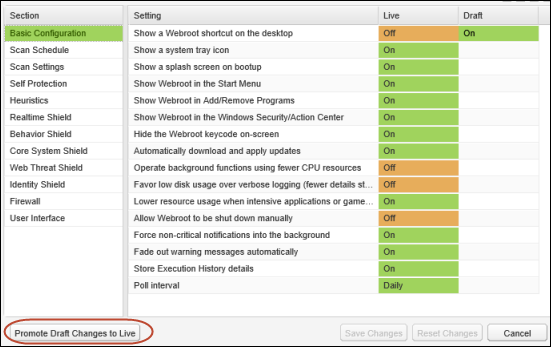 The Live column shows how the setting is currently implemented on the endpoints. Under the Section column, select the category you want to edit. When you're done with a section, click the Save Changes button. Continue editing the policy, making sure to click Save Changes before you move to another section. Any policy with changes not yet implemented displays Yes in the Draft Changes column. 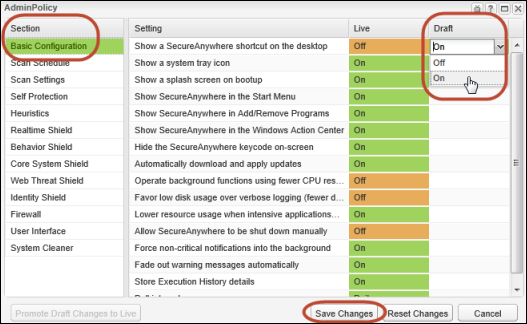 The Basic Configuration settings control the behavior of the SecureAnywhere software on managed endpoints. 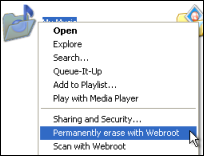 Automatically block files when detected on execution Blocks threats and sends them to quarantine. If this setting is off, the user must respond to alerts about detected threats. The Web Threat shield protects your endpoints as users surf the Internet. If it detects a website that might be a threat, it opens an alert for users to block the site or continue despite the warning. When they use a search engine, this shield analyzes all the links on the search results page, then displays an image next to each link that signifies whether it's a trusted site, shown by a green checkmark, or a potential risk, shown by a red X.